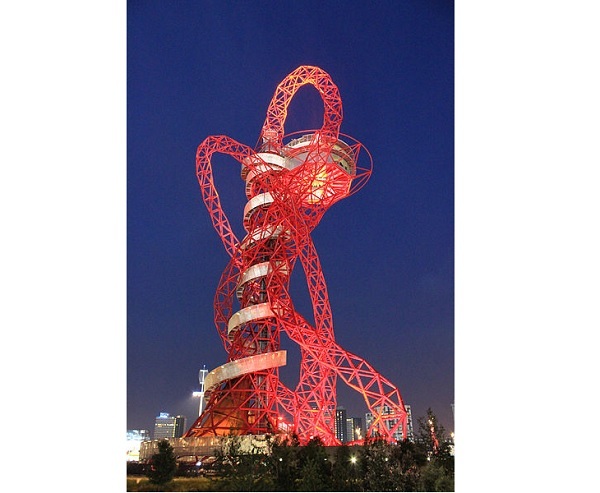 ArcelorMittal Orbit is a striking 114.5-meter or 376-feet tall sculpture and observation tower located at Queen Elizabeth Olympic Park in Stratford, London. It was built as a lasting landmark highlighting London’s hosting of the 2012 Summer Olympics. It is considered as the largest public art piece in Great Britain. The idea for the ArcelorMittal Orbit was borne out of a need to attract Londoners and visitors into the site of the Olympic Park in Stratford, London. London Mayor Boris Johnson felt that the area needed a striking attraction in order to bring people into the area. It should be something that should arouse the curiosity of the people, enough to visit the area to see it for themselves. For the said landmark, the city held a design competition in 2009, which called the design of an Olympic tower. The competition attracted 50 submissions. After the submissions were reviewed, the panel chose the design made by Turner Prize-winning artist Anish Kapoor and Cecil Balmond of engineering firm Arup. The contest winner was announced to the public on March 31, 2010. Construction of the sculpture and tower was undertaken on November, 2010. The tower reached full height by November, 2011. The completed structure was presented to the public on May 11, 2012, just in time for the London 2012 Summer Olympics. The Orbit is a unique sculpture and observation tower that stands 114.5 meters or 376 feet tall. The designers wanted to introduce a radical design that combines both sculpture and structural engineering. The structure is characterized by the trunk, which is a vertical tower that houses the elevators and supports the observation deck. It is then surrounded by an open lattice of red steel. It acts as an irregularly-shaped tripod that stabilizes the trunk. Steel is the primary material used in building the tower. The Orbit has an observation tower with two indoor viewing platforms on two levels. Each level has the capacity to hold 150 people. Visitors are provided with spectacular views of the 250-acre Olympic Park and the London skyline. Visitors take the elevator going to the top and take the spiral staircase to go down from the tower. The stairs are designed to provide visitors with stunning views of the area as they descend.